Akiba Abaka: Director of the year for "In the Continuum"It is a classic case of an always-the-bridesmaid finally becoming a bride. Last Monday, Dorchester resident Akiba Abaka headed to the 12th annual presentation of the Independent Reviewers of New England Awards (IRNEâ€™S) for the umpteenth time. As founder and producing artistic director of Up You Mighty Race theatre company, she had been nominated 10 times over the years and had always gone home with memories, but no award. 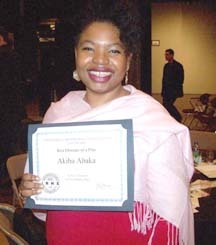 Abaka was nominated for her Fall 2008Â direction of â€œIn the Continuum,â€ aÂ play that contrasts two women facing the AIDS pandemic: a troubled teen in South Central LA Â and a successful newswoman in Zimbabwe. IRNE voters were similarly enthusiastic and Abaka finally walked away with the award. With the IRNE Award, Up You Mighty Race solidifies its reputation as a professional theater ensemble, and Abaka foresees herself, fulfilling all her ambitions and dreams.